The following is an article on Chelation that was brought to my attention by Skeptico and I thought that it was a great article to address as a parent who is currently chelating their child. Someone once said that when your child is diagnosed with autism, you begin to meet a better class of people. The volunteers call the cross-country trip a doggie relay. The Kuehn family calls it a godsend. For two Labrador retrievers, Trikzy and Daisy, and 12-year-old owner, Joshua, it's their lucky break. Joshua, who is autistic and is calmed by the animals, was faced with the possibility he might have to give up the dogs for adoption after airlines told his parents it would be too hot in the cargo hold to fly the dogs to the family's new home in Phoenix. So the Kuehns reluctantly put the dogs up for adoption, posting an e-mail on AutismLink, a Web site that provides information and support for families with autistic children. But the response they got was not what they expected. A woman from Du Bois in Clearfield County told them, Your dogs are coming with you. And so this morning, Trikzy and Daisy will begin the first leg of a three-part trip involving volunteers from two states who will eventually take the pair to their new home in what they call a doggie relay. "When I heard the news I lost it," said dad Jeffrey Kuehn, a security guard from McDonald. "Strangers are doing this and that's what's amazing about it." The effort is especially important to Joshua, who is diagnosed with Asperger syndrome, an autism disorder that limits his communication and social skills. "They help through the battles and through with making friends and everything," Joshua said. "They're the only ones I can really talk to." The dogs comfort him, said his mother, Kathleen. "It was a godsend because I don't think my son would go without them," she sad. The idea for the dog relay began last week when Jenny Webster, of Du Bois, saw the Kuehn's e-mail seeking an adoptive family for the two dogs on AutismLink. The family was relocating to Phoenix for better jobs and warmer weather, and couldn't bring the dogs with them. After the airlines turned them down, the family found out that a professional pet transporter would charge them $1,400, an amount they couldn't afford. "He wasn't going to have his dogs, his best friends," said Webster. "I have an autistic child and I know how attached he can be to things and people and animals. If I were in that situation I would have hoped someone could help me out." Touched by their story, Webster sprang into action, sending out e-mails asking for volunteer drivers to help the cause. In a few days, people from across the nation were responding with donations from $5 to $200 and a few offers to drive. Through the AutsimLink Web site, Webster, a stay-at-home mom, secured two drivers and $800 for gas. "This has been fast," she said. "But I'm up for it. It's going to be fun." Two others up for it are Jenn Engle of Albuquerque, N.M., and Swissvale resident Lenore Wossidlo. Wossidlo picks up the dogs in McDonald today and will meet Webster at the intersection of Interstates 79 and 80 in Mercer County. In the second pass-off, Webster will take the dogs about 1,500 miles to a restaurant in Elk City, Okla., which is about 100 miles west of Oklahoma City. Engle will then pick up the dogs and head another 550 miles to Albuquerque, where Jeffrey Kuehn will be waiting to take the dogs the rest of the way to Phoenix. None of the volunteers have met Joshua, but they all say they couldn't let him be separated from his longtime pets. "This is a boy with autism who is moving across country to a new school, new friends, new neighbors," said Wossidlo, who also has an autistic son. The disability makes even simple changes like driving a different way to the store confusing and upsetting, said Dr. Nancy Minshew, a psychiatry and neurology professor at the University of Pittsburgh School of Medicine. "Other kids may be excited about getting a new room, new bedspread and more, but this is the kind of kid who will probably want everything to be the same," she said. In Joshua's case, the dogs help calm him when things do change, said his mother, Kathleen. Trikzy, a black lab, was Joshua's a birthday gift six years ago. Daisy was rescued from an abusive home two years ago. Both dogs are close to him, but 68-pound Daisy is extremely attached, she said. "The yellow lab sleeps with him and tells him what time to go to bed," she said. "When he goes to school, she cries. Those two are so attached it's unreal." For Wossidlo, who also is involved in autism awareness efforts, the doggie relay is more than strangers driving two dogs 2,100 miles across the country. It's a show of compassion, she said, for an autistic boy and his dogs. "And it all started a week and a half ago," she said, "with one e-mail saying, Can you take my dog?" If you don't click this link and contribute $5 to the effort, then you have no soul. You can keep up with the doggie relay over the weekend here. Several weeks ago I posted the RFK Jr. article, Deadly Immunity, to my site. I posted that I had begun to look into the details of the Verstraten study and it seemed that there was sufficient evidence show that malfeasance had taken place. I said that I would be posting on it “soon”, but soon became not so soon as the more I read, the more I found that there was to read. 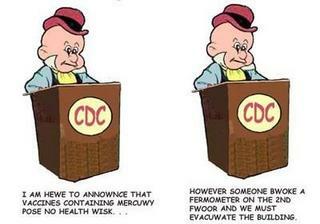 The entire story about what the CDC knows and when they knew it seems to be about as complicated as the mercury/autism theory itself. So at some point I need to take a break from researching and just start writing about what I am finding. It is time for me to dive into the discussion. Please keep in mind, I still have not finished digging through all there is to dig through, so this is open to update and correction, and especially open to finding additional sources of information. I want this to be an open dialogue. I am attempting to use as many primary sources as I can, but I am not ruling out the use of secondary sources. I also want to take care to evaluate the information primarily based on the information, rather than on who is offering it. Reputation of the person and conflicts of interest certainly need to be factored in when evaluating an argument, but I don’t want to dismiss an argument based only on who brought it to the table. The argument itself should rise or fall on its own internal logic and fit into the bigger picture as much as possible. The assertions of Offit, The Geires, McCormack, Haley, Gerberding, Kirby, Fineberg, Redwood, etc. should all be heard. I also want to explain that my approach to the question of whether or not the mercury in thimerosal contributes to autism. Most of the discussion seems to start with autism and try to work backward to see if mercury is the culprit. That is certainly an important line of inquiry, but what find less of an emphasis on, and what is more interesting to me at the moment, is the idea of starting with mercury and working forward to see if you find autism. If the mercury/autism holds water, then the arguments traveling in each direction should meet in the middle. Feel free to quote me, but please ask permission to use my images (I reserve all rights, but I try to be generous, however I might have to say no once in a while). I am hoping that this will encourage HEALTHY debate, and not merely be another place on the internet where people on both sides vent their frustration on one another. Differing opinions and interpretations of information are graciously invited. Contempt is not. Good natured satire is always appreciated as always. Also, please bear with me if there are long pauses between posts. I have an autistic son ya know. Update: I just got a call from the AJC that they are going to print my letter. Yesterday I read an opinion piece printed in the Atlanta Journal Constitution by a member of the editorial board. I wanted to post it here so that I could both answer it, and record it for posterity. It is an example of the kind of harsh, myopic criticism against parents like me who question the conclusions of the Institute of Medicine and choose to treat their child’s autism medically. The response I make to the article is not a full one, but a succinct one that I felt would have a better chance of being printed in the letters to the editor. To try to respond to all the problems and biases in this piece would require a book. A book like Evidence of Harm for example. A recent survey by the Atlanta-based American Cancer Society found that roughly half of Americans believe that surgery causes cancer to spread. And about 25 percent think that science has already found a cure for cancer, but it is being held back by a profit-driven health care industry. The continuing controversy over whether autism is linked to trace amounts of mercury used as preservative for childhood vaccines is in this same category. In recent years the Centers for Disease Control and Prevention, the Food and Drug Administration, the Institute of Medicine (the medical arm of the National Academy of Sciences) and the American Academy of Pediatrics have all debunked the concern that thimerosal, the preservative, causes or even contributes to autism. At least five major scientific studies have come to the same conclusion. Yet the number of people who believe the link has been firmly established — parents of children with autism, in particular — continues to rise. They received a significant shot in the arm last month when Robert F. Kennedy Jr. wrote an article in Rolling Stone magazine suggesting the nation's public health community is conspiring with drug makers to cover up the damage done by thimerosal. A government bureaucracy that willingly subjects children to the risk of autism in exchange for propping up the pharmaceutical industry certainly wouldn't want a cure for cancer to become widely available, now would it? "It's really terrifying, the scientific illiteracy that supports these suspicions," said Dr. Marie McCormick, chairwoman of the Institute of Medicine panel that issued its report on the research about thimerosal and autism last year. It's one thing to refuse to consider the scientific evidence; it's quite another to act out of willful ignorance and subject yourself or a loved one to what amounts to medicine-show cures. Yet that's what some parents of children with autism have begun to do with chelation therapy, a treatment that should be confined only to patients with acute metal poisoning. Chelation involves using drugs to remove heavy metals from the body, but when administered improperly — as in using it for patients with autism — it can lead to liver and kidney damage and other problems. Similarly, some autistic children are prescribed a dozen or so vitamin supplements to take every day, and their diets heavily restricted as a way to deal with the condition, according to testimony in lawsuits. Some are subjected to 160-degree saunas to sweat the metal from their systems. The panic stems from a 1999 FDA finding that the amount of mercury contained in the normal immunization schedule for children exceeded the agency's guidelines. By 2001, no vaccines for children had more than a half of a microgram of mercury in them — an amount that is roughly equal to that found in an infant's daily supply of breast milk. But the controversy continues, fueled at least in part by the alarming rise in the diagnosis of autism. In the 1980s, the condition was found in roughly one child in every 10,000 births. By 2003 that ratio had changed to 1 in 166. Suspicion is so strong in some circles that CDC researchers told The New York Times recently that they have received threatening letters and phone calls. The Atlanta-based agency has increased security because of the threats, the newspaper reported. Although it hasn't felt such a backlash, the American Cancer Society — located across the street from the CDC — must understand the frustration. The organization asked 957 adults without cancer to answer a true-or-false quiz. Fifty-four percent said they either weren't sure or were convinced that surgery spreads cancer; 27 percent said they believed a cure was available but being withheld; and nearly 20 percent believe pain medications were ineffective in cancer patients. Over the years, cancer and pain-management specialists have made remarkable progress in that arena. What a shame that message hasn't gotten through to some patients and their loved ones. — Mike King is a member of the editorial board. His column runs Thursdays. I read your piece and wanted to let you know my thoughts on it. As the parent of a mercury and lead poisoned child who has been diagnosed as autistic, and as one who has spent the last year watching him recover through the biomedical interventions that you seem to mock in your writing, I have to tell you that my first impression on reading it was, "Wow. I wonder how this guys is gonna feel when he begins to realize that he is on the 'wrong side of history'". Thousands of kids with autism are improving, and some are even becoming indistinguishable from their peers through these biomedical interventions. I believe, with what I am seeing in my son's life and in the other autistic children that I know, that in ten years a more refined version of the interventions that you malign now will be the SOP in the treatment of autism. You can argue about studies all day long, but you can't argue with results. Next time, interview a few of these "scientifically illiterate" parents to see just why they dismiss the opinions of Marie McCormick. I think you will be surprised how scientifically literate they are, and just how poor Ms. McCormick's judgment is when it comes to weighing the scientific literature on autism. I only hope that your column does not deter some parents who have a newly diagnosed child from seeking medical treatment for autism, which is a medical disorder. Ummm... so which is it? A student accused of spilling mercury at Cedar Springs High School is now being charged with a felony. On May 11, authorities say 18-year-old Ryan Gorter was caught playing with a dime-sized amount of mercury in class. That prompted school officials to shut down the school for two days while crews cleaned up. The cleanup cost the district more than $40,000. Now Gorter faces charges of malicious destruction of property, which carries up to ten years in prison, as well as unlawful possession of a harmful device. He has been released on bond. He's accomplished something most adults will never achieve and he's only 7-years-old but age isn't the only thing Aidan Gold has had to overcome. Aidan Gold of Bothell, Washington is already reaching for the stars and never was he closer to them than when he summited Mount Rainier. 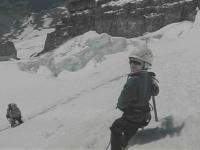 His parents have the pictures to prove it and others on Rainier were shocked to pass this pint size climber. Warren Gold, Aidan's father, says, "Everyone would stop and wait and watch. Part of it was curiosity and part of it people were just concerned about him." Aidan says no need to worry. He's a veteran who's climbed many a mountain. His parents are avid climbers and early on Aidan started following in their footsteps quite literally. "I think I have the focus," Aidan says. That focus comes from a type of autism called Asperger's Syndrome. "What seems to come with this is an intense ability to focus on things the child is interested in,” says Warren. It allows Aidan do amazing tasks, like create elaborate origami and climb 14,000 peaks to the awe of others. His parents admit they've gotten questions about safety. "To be honest, I think it's more dangerous to drive on our freeways. In the mountains we can control our risks to a high degree," Warren says. old to reach the peak. This week Chandler and I went to Washington to attend the Power of Truth rally, and to lobby our representatives in Congress to ban the use of thimerosal in vaccines and fund autism research. I will be posting the details of our trip later. For now I will share the images of the rally. I have decided to post them with out comment. I don't think they need any from me. Thank for visiting the site. I invite you to add your email to the mailing list so you can be notified when the blog is updated. Look at me! I am a real live blogger!